Before you know it, Halloween will be here. Walgreens will be fully stocked with your favorite bite size candy bars and you’ll be deciding which Halloween party to attend. But what about Fido? 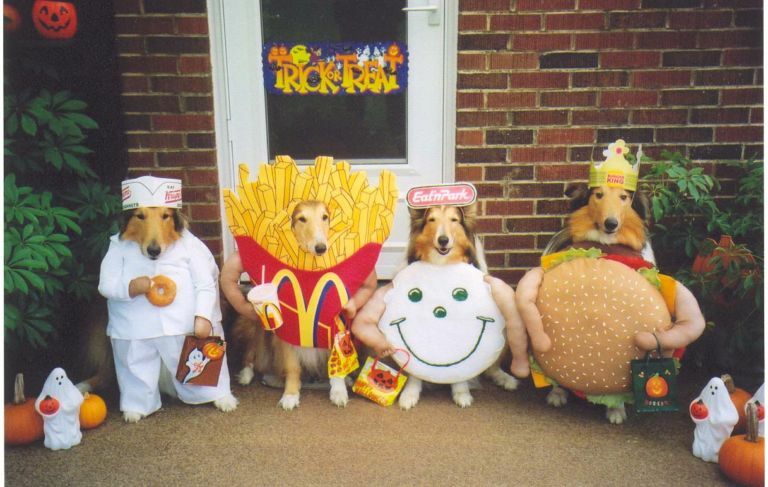 For those folks that like to dress up their dogs, Halloween is the perfect opportunity to go all out. Here’s some tips on how to pick the perfect Halloween costume for your dog. Something that’s ‘with the times’. News stories, celebrities, social commentary – those always tickle people the right way. Lady Gaga, Presidential Candidates…people love that stuff. Not everyone may ‘get it’ – but for the people who do, they’ll appreciate your creativity that much more and you’ll have an instant connection. This was my personal favorite from last year. Remember this? The costume matches the dog. Like people, dogs have personalities and have a certain kind of attitude. If your Chihuahua likes to prance around and play hard to get, it might be appropriate to dress her like bombshell heart-breaker. Short skirt, blond wig – I laugh just thinking about it. Many times, the dog reflects the owner. So if you dress your dog like a Star Wars character, it just might be saying something about your love for sci-fi. 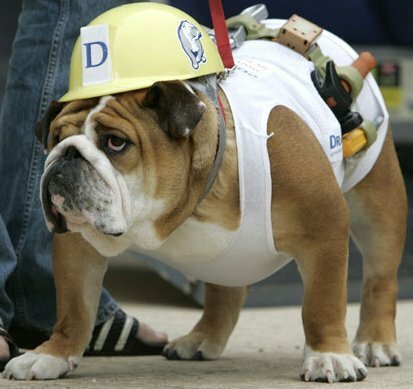 This dog was made for that hard hat. Think he does a good cat call? It’s all in the details. People notice when you’ve done a beautiful paint job or perfectly stitched the two piece doggie swim suit. If there’s a subtlety in your dogs costume that people smirk at – your dog is getting serious bonus point. The book cover does it for me. Have fun. There’s no point in stressing about something that’s suppose to be fun. If you’re not good with crafts, you don’t have to create your own. Party City has a whole section for Dog Costumes. If you really want something original, contact a vendor through Etsy and see how creative you can be. If you get your friends together and brain storm ideas with each other, you might be surprised at the fun that ensues. And above all: TAKE PICTURES. Take LOTS and LOTS of pictures. Cameras phones have eliminated all excuses for this. After all that hard work getting your dog a great costume, make sure you share the love by bringing your dog to a Halloween Dog Parade. Your neighbors will thank you for it.